I have always enjoyed lighthouses and have photographed over 50 lighthouses in the past 6 years, but this was my first time to actually spend the night in a lighthouse. I was so excited for the experience and didn't know quite what to expect. I was in for a delightful time and I loved staying in a lighthouse for the night. It is hard to say what I liked best. I really enjoyed the access to the lighthouse and tower at all times of the night and day. The views of the harbor in the middle of the night were fantastic and I loved being able to get photographs at sunrise and sunset. It was a full moon the night we stayed at Two Harbors, Minnesota lighthouse so I had the added experience of capturing the moon and lighthouse in a photo together. 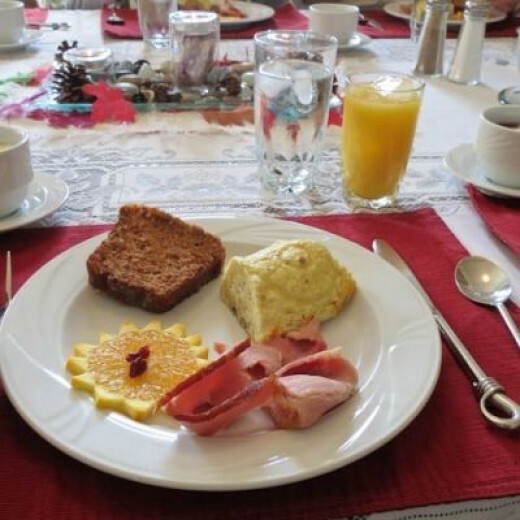 The fun of sharing a bed and breakfast and meeting new people was also great. There were three couples staying in the lighthouse and one in the skiff house on the property. 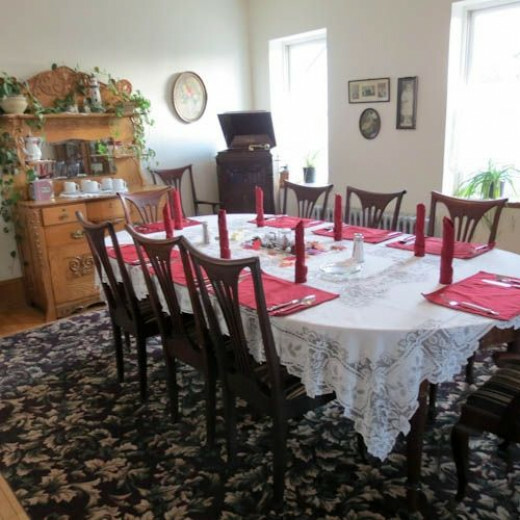 We all met in the dining area in the evening for snacks and again for a delicious Scandinavian breakfast in the morning. For me the lighthouse B&B was a great experience that I would recommend to anyone who loves lighthouses. 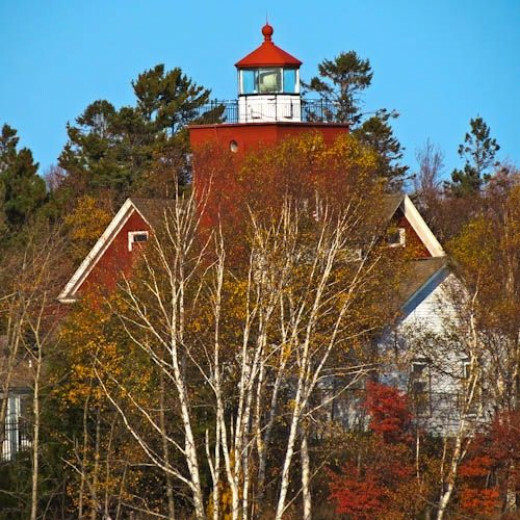 The colors were at their peak when we visited Two Harbors lighthouse on September 30, 2012. The comfortable dining room had a welcoming atmosphere. 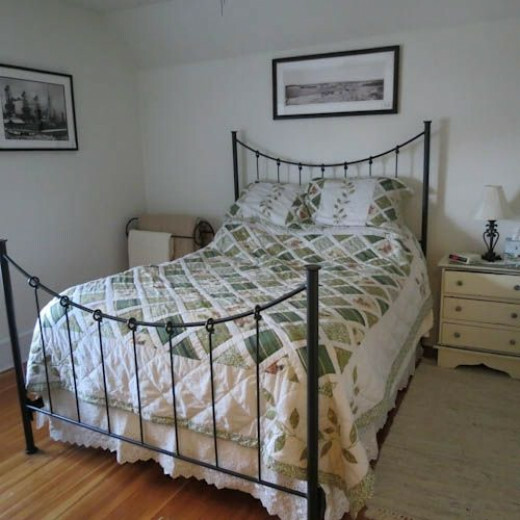 The lighthouse has three guest bedrooms on the second floor. There is one bathroom that is shared by the three rooms. 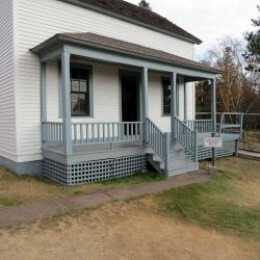 In addition the lighthouse has a Skiff House on the property that is now used for an additional guest room. It has a large room with private bathroom facilities and a Jacuzzi tub. We stayed in the Harbor room that is pictured above. It was a comfortable room that had a great view of the harbor. 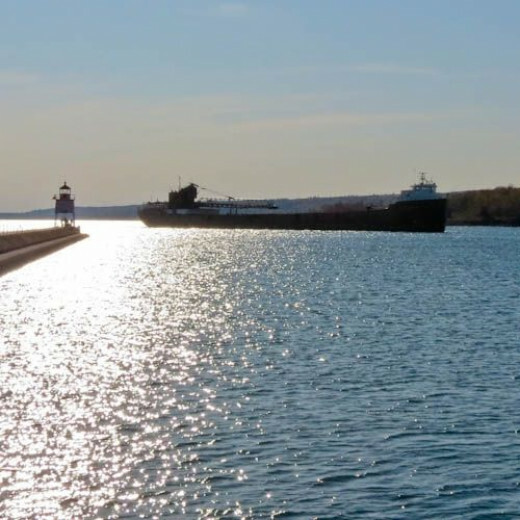 Two Harbors lighthouse is situated in Agate bay where you can watch ships of iron ore come and go. These shipping operations first began in 1884 when the first iron shipment was loaded for shipment from Agate bay. While we were visiting a large ship came into the harbor at about 6 pm. 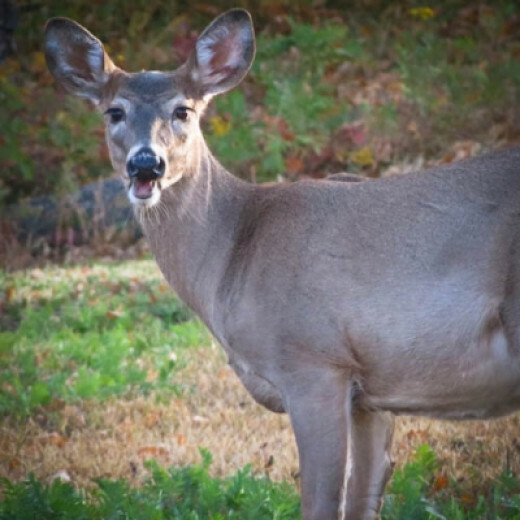 and left just after midnight. It was fun to watch the ship come in from the pier and then when it left I watched it from our bedroom window. I always love to climb a lighthouse tower and see the view from on top. Usually I visit a lighthouse and get one trip to the top to see the view, but while staying at the lighthouse B&B I had the opportunity to climb the tower anytime I wanted day or night. Since we were already staying on the second floor the climb to the tower was only two short flights of stairs to the lantern house. I ended up climbing to the top on 4 different occassions, one time late at night when it was a bit spooky since I was all alone. It was fantastic though to view the harbor at night. The harbor was all lit up and you could see the sweeping lights from the lantern along the shore. 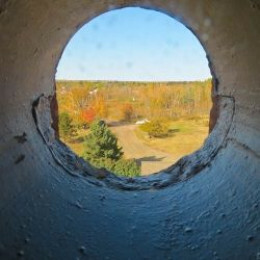 The photo in this section is taken through the portholes at the top of the lighthouse during my afternoon climb up the tower. The lantern gallery is only 43feet 6 inches high but when you add that to the location of the light along the shore, it sits 78 feet above the water. 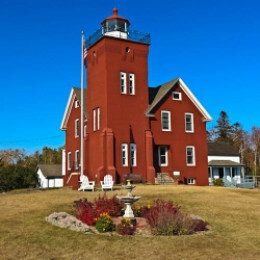 The lighthouse at Agate Bay near Two Harbors was authorized by US Congress in 1886 and was first lit in March of 1892. It was built on a rocky area on the east side of the bay. They had to blast nearly 600 tons of rock out of the bedrock to form the fountation of the lighthouse. The lighthouse and the keepers house were connected and yet they were two separate structures. There is a very thick wall where the two structures come together, which protected the keepers family from a fire or explosion. I woke up early to catch the sunrise on my camera and then enjoyed a 2 mile trek along the shores of Lake Superior. The hiking was great and the views were wonderful. This poster shows several of the photos I took while hiking the trails. 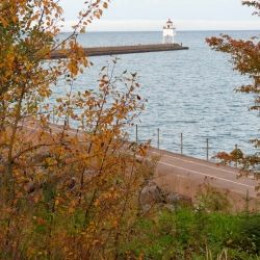 At the end of a L shaped pier you find the second lighthouse at Two Harbors. This lighthouse was built in the 1940's and is 25 feet high. It has an octagonal lantern house and sits on steel legs that let the waves splash beneath it. 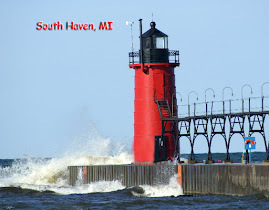 I walked out to the lighthouse in the early evening to watch a large iron ore ship that was just coming into the bay. It seemed to be a popular place for people to come out to watch the ships. 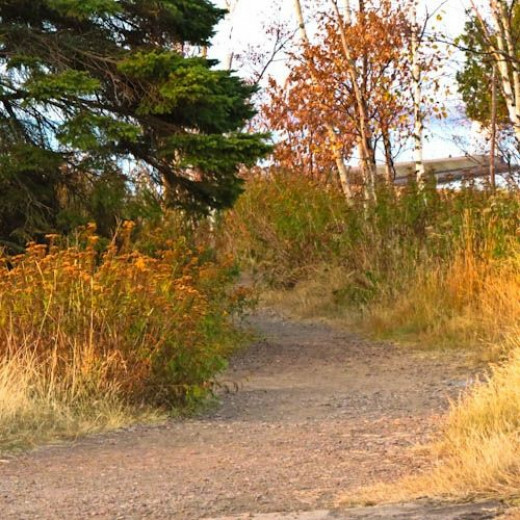 The grounds of Two Harbors lighthouse contains several additional attractions. 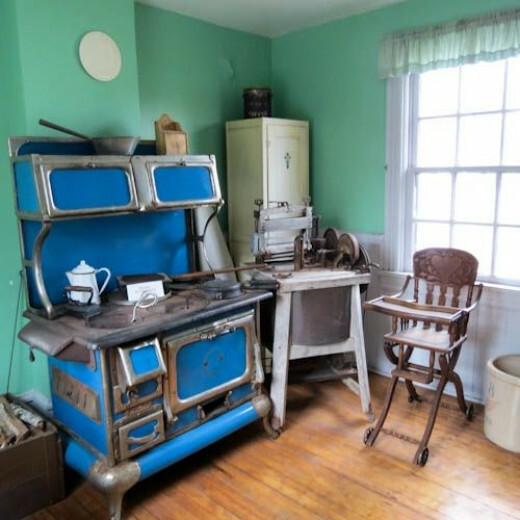 The assistant keepers house has been restored with original furnishings from the late 1800's and future plans are to turn it into a rental cottage for the B&B. The old Skiff House, which was once a power house, is currently being used as a rental for the B&B. The fog signal building has been turned into a nice gift shop for the lighthouses. It has a wide variety of items depicting the lighthouses and the area. I purchased post cards, a lighthouse apron and a lighthouse sweatshirt while I was there. At the edge of the ground is the Frontenac Pilot House. This pilot house, which was once part of a ship, is now used as exhibit space for the lighthouse and shipping museum. I toured the house and found the exhibits to be interesting. 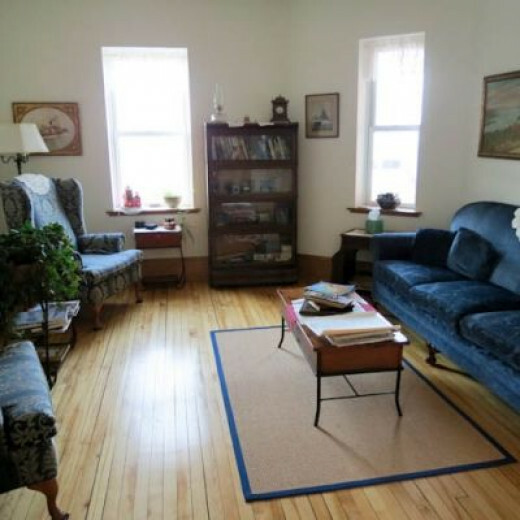 You also have a great view of Lake Superior through the windows of the pilot house.